This is the third story in the Mickey Bolitar stories and remains as fast paced and quick to the chase as you’d want from the thriller writer Harlan Coben. Mickey is a kid whose father died in tragic circumstances and now he’s a sophomore at High School trying to adjust to new life. His best pal Spoon is in hospital, his legs paralysed and his mother blames Mickey. Rachel, the school hottie doesn’t want to speak to him and Ema, the goth, reveals that her online boyfriend has vanished. Spoon hasn’t given in however, he’s the computer nerd who can find out things no one else can. He knows Mickey is looking out for him. If you have read the first two books you know about the Abeona Shelter and the secret lives these kids live rescuing missing kids. If you haven’t, this is a good surprise. But who is the old bat lady and what are those tunnels doing under her burned out house? And what is the truth about Jared, the boy who led Ema to expect a lot more than rejection. Is he even real? 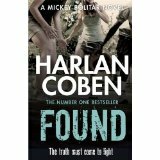 Found is fun, tense, strange, all the things you’d expect in a Coben thriller with some surprising twists along the way. My high school was never this interesting.